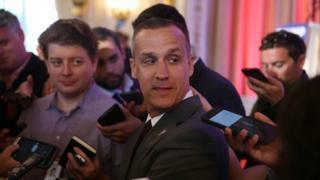 A US singer has filed a sexual assault claim against President Donald Trump’s former campaign manager, Corey Lewandowski. Joy Villa says Mr Lewandowski hit her twice on the backside during an event in Washington last month. She told the US media she spoke to the police on Christmas Eve, having been persuaded to launch a formal complaint by friends. Mr Lewandowski has not responded to US media’s requests for comment. “I was initially fearful to come forward with this,” she said, according to the Associated Press news agency. She said she did not want to embarrass Mr Lewandowski’s family or hers. Ms Villa, who is a vocal Trump supporter and wore a “Make America Great Again” dress to the 2017 Grammy Awards, was at a gathering at Trump International Hotel when she posed for a photograph with Mr Lewandowski, whom, she says, she had never met before. She alleges he hit her once on the buttocks, and when she asked him to stop and joked about reporting him for sexual harassment, he did it again. She said he laughed, adding “I work in the private sector”. She said the hard slaps felt “disgusting and shocking and demeaning”. News site Politico first reported on the incident last week, saying they had talked to a witness who spoke out before she did. Ms Villa has previously said she is considering running for Congress – and President Trump has tweeted his support. Mr Trump fired Mr Lewandowski as campaign manager in June 2016. Earlier last year, he was charged with battery after allegedly yanking a female reporter out of Mr Trump’s way after a campaign event. The charges were later dropped.